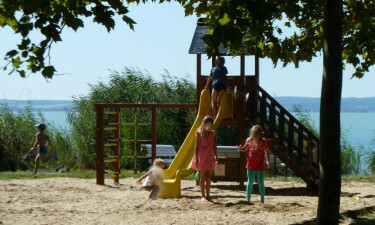 The luxury camping site of Pelso is located in the picturesque Alsóörs region of Hungary. Known as one of the best-kept secrets among those who have been looking for an unforgettable camping holiday, this site is suited for children and adults alike. Not only can guests enjoy a pristine natural environment, but the proximity of this holiday camping site to Lake Balaton is another benefit. Lux-camp will be happy to provide more details upon request. Why Should I Camp at Pelso? Maritime activities such as sailing and surfing are found nearby. The availability of a variety of mobile homes. There are numerous activities designed around the needs of young children. Food provision facilities are open every year between January and late October. Snack food outlets and a restaurant known as Marga are open to all guests here. Traditional Hungarian cuisine as well as international dishes can be enjoyed. There are several pubs found just outside of the campsite itself. Visitors to this luxury camping site can take advantage of facilities such as baby changing rooms, tumble dryers, washing machines and bicycle hire service. All of these areas are accessible by wheelchair.